Editor’s note: This is the fourteenth installment in a series of dispatches from the Rath family (Colin & Pam, daughters Breana, Mariel and Nerina), who departed Stamford, CT in the fall of 2014 for a worldwide cruise aboard their Hanse 545 Persevere. You’ll find previous articles linked below. I have sailed my whole life on the East Coast of the USA and the Atlantic Ocean…up to now. We found out immediately that the Pacific Ocean is a completely different animal as we set sail from Panama City. In fact, Pam and Nerina, who had been using Scopoderm daily since we left New England, stopped taking them and only used them in rough weather after our first day of sailing in the Pacific. Which is a big huge with the crew aboard Persevere. A happy crew makes life so much easier. The Pacific is a mostly a smooth, gentle sleigh ride of following seas, compared to the bronco ride of choppy waves that we were used to in the Atlantic. The wind is also higher above the water in the Pacific, so the waves aren’t as choppy and squalls don’t have the wind vacuum that they do on the East Coast. It’s more of a warm shower that passes through without the wind vacuum. The warm water around the Equator has a lot to do with it. Also, once you hit the Equator the trade winds get an added current push from the Earth’s rotation. That’s kinda cool if you think about it – sailing on the widest part of our world and the gravitational force spinning the globe gives you an extra nudge as you sail across the Pacific. Our sail to Galapagos took six days. That was the end of the Jim Cornell Pacific Rally, with everyone going on their own schedule from there. No worries, we have been running into participants all over the Pacific. We had to motor for two days. There was a huge high-pressure hole off Ecuador on the way to the Equator (other cruisers said it’s almost always there and there’s no way around it), and then there was a day of rain squalls which allowed me to clean the boat for the first time since Panama. The rest was another slow reach to the islands doing 6 knots. Cruising boats are only permitted to visit three islands in Galapagos. You can see more if you wish to pay for a more extensive permit (which can cost up to $30,000 or more) or do it aboard Galapagos-approved charter boats. We went to San Cristóbal, Santa Cruz and Isabela for a little over a month of snorkeling, diving and exploring. 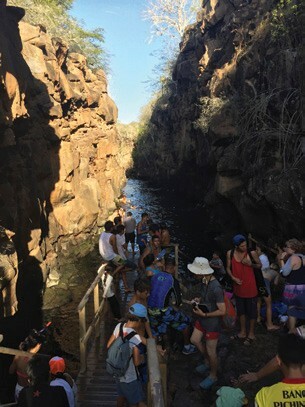 One of the reasons for Galapagos’ uniqueness and wide range of wild inhabitants is that it’s a major crossroads for three large underwater currents that provide the waters with rich nutrients and make the water colder than the surrounding region. That’s why you’ll find penguins on the Equator. The South Equatorial Current comes from Central America. Next, the Equatorial Current comes from the Pacific and finally the Peru Current comes from South America. The combination of two cold currents and one warm one mixing together in Galapagos makes a unique micro-climate in which nature flourishes. Since Galapagos has been well protected, the animals are not afraid of humans at all since they are not a known threat. You are able to see nature up close. My family went snorkeling with sharks, penguins, sea lions, iguanas, sea rays – you name it. They come within inches of you. 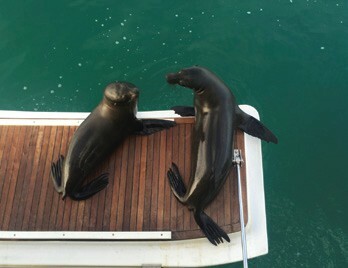 You will be sitting on a park bench ashore and sea lions will come right up to you and sit under your bench. They are very cute, but smell terrible, so the cuteness wears off real fast…especially if they find your dinghy at night and decide to spend the night. It usually takes 30 minutes to clean it out afterward from the poop and fish smell. They are cool to watch en masse though – several hundred will fill the beach at night and fight for their sleeping spot or sleeping partner, usually making a loud and noisy slumber party. Our first stop was Wreck Bay on San Cristóbal. After learning our lesson with the dinghy and sea lions, we decided to use the local launch taxis. These work like a club launch – hail on channel 16 and pay when you’re dropped off. These nice and convenient shuttles run from 9 am till 10 pm daily. The next thing that you learn is each island tries to sell you tours to see everything in their backyard, and each island has its own distinctive 100+ year-old tortoise. These turtles are about the size of a small dinghy. 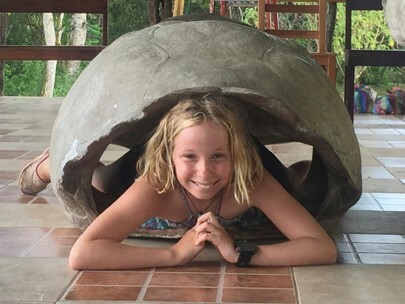 Each island will try to sell you to go see their specific turtle, but once you’ve seen the first one and the kids have played with the oversized shells and watched these prehistoric vegetarians at play, you have seen them all. See them, but just once. Each island’s version isn’t that much different. Also, most of the tour guide destinations are only a short walk or dinghy ride away, so you can get to most of them on your own. Plus, you can swim with everything right at anchor, or swim a hundred yards to the reef where the water is a nice, cool 60 degrees and full of everything you expect in Galapagos. The kids enjoyed every one of the universally unique species in sight. Academy Bay in Santa Cruz is on one of the largest islands. There is a huge volcano crater that you do a two-hour horseback ride up to and then hike to the active steam spouts in the lava field. The kids loved the ride, and the solidified lava flows were fantastic. Many raw chemicals are present and the rock colors are out of this world. It really is a walk back in time, with the large iguanas crawling everywhere. Penguins are everywhere in the harbor. These cute little guys were darting about alongside Persevere, but we were running low on provisions and had to move on. We finally gave in to a guided tour at our last stop, Isabela. We did a private fishing/snorkeling charter. We caught five 50-pound tuna and a 70-pound wahoo within the first hour. As soon as we put the line back in, another fish hit. The charter immediately set up sashimi and we got a snack before snorkeling with sharks, sea rays and sea turtles. The girls loved it. After an hour of snorkeling, we came aboard to an amazing wahoo barbecue. Only Galapagos natives are allowed to fish in their waters and the fish are all sold to the local restaurants, so the fish are abundant in the sea. The local fish market is a daily show as sea lions, albatrosses and penguins engage in a free-for-all fight for the scraps from the fish being cleaned. We spent a lot time in Isabela getting ready for our next voyage to Marquesas, some 3,000 miles away. Look for updates on Persevere’s journey in future issues of WindCheck. You can track the Raths’ progress, and follow them in the 2016 Rolex Sydney to Hobart Yacht Race, on their Facebook page, “Persevere60545.” Colin’s new book, It Is What It Is, can be purchased on ColinRath.com or at any major bookstore. Look for his next book in the fall of 2017.